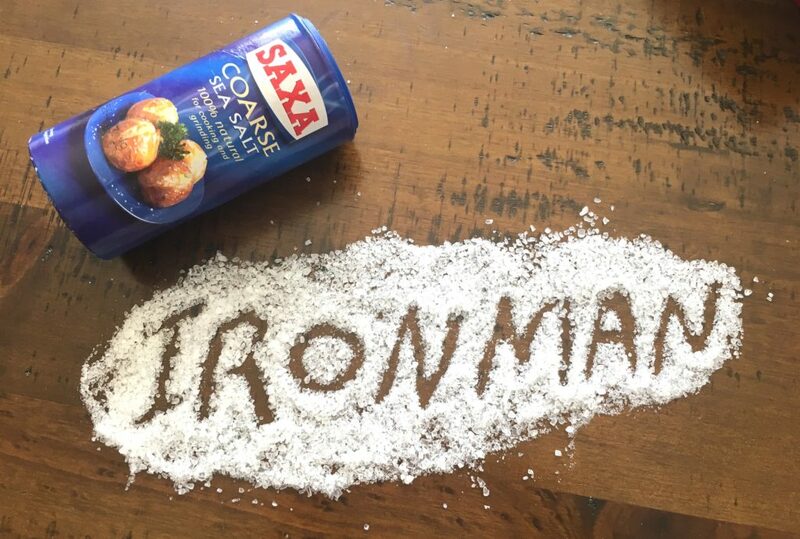 Salt Supplementation & Sweat testing for Ironman – Why it’s not about cramping! Old wives tales are great for getting the kids of to sleep but should serve little or no place in Nutrition Science. However, we have the persistent commentary that salt supplementation prevents cramps in the same manner lactate is rolled out by the TV commentators as the cause of fatigue. In this article I want to dismiss some myths about salt/sodium use, sweat testing and how to integrate the information from this review into your competition nutrition safely and effectively. Before we begin there will be some science here as much of the marketing of salt and sweat testing is positioned on scientific precision and evidence. However, we rarely see what science underpins their testing and related claims. As such I have fully referenced this article with the scientific studies used to form my views on salt supplementation and related sweat testing. If you are short on time simply jump to the, ‘HOW TO USE GUIDE’ at the end to see the application of the research and information from the article. Figure 1. Me and salt loss post Barcelona marathon (see salt on clothes – Salty sweater? So what…). This absence of chloride in the urine according to the authors of the study suggested an excessive shortage of chloride (and as such sodium) in the blood. However, it was known that sweat contains much lower levels of salt than in the blood, so as sweating (loss of more water than sodium from the blood) continued the level of sodium in the blood would actually concentrate. The study author was aware of some animal data that demonstrated that animals forced to ingest large quantities of water developed muscle twitching, and from that the miners cramp must be due to excessive water consumption. Therefore, the author decided to develop a solution that had a sodium chloride solution (0.51g sodium/500mls) (double that in lucozade sport), and test it on miners as a means of preventing cramp. The effect of this drink on 7 miners where that only 4 felt it benefited them (not exactly an endorsement for this level of intake). The result of the study from the authors point of view however was that cramp due to sodium loss was made worse by excessive water consumption. Then in 1929, Hancock et al. proposed that since drinking water will continue a drop (loss) of chloride (and sodium) in sweat from the blood; salt will move from the cells (including muscle) to maintain blood sodium concentrations (maintenance of osmotic pressure). Under resting conditions the kidneys would expel excessive water and as such retain sodium and chloride levels in the blood. Yet according to Hancock and colleagues it was thought that during exercise blood flow is diverted to muscles and skin and thus making the kidney ineffective. The result is a continued loss of sodium/chloride in the sweat and due to water ingestion a continued lowering of the levels of sodium/chloride in the blood (despite not actual evidence in humans demonstrating this effect). By the 1930s Dr Talbott of Harvard concluded that when a critical level is reached in the working (exercising) subject, muscle cramp would occur. The obvious solution here was to ingest more sodium as suggested by Dr’s Moss and Haldane. A big problem with the theory of sodium depletion based muscle cramping is that there is almost no evidence demonstrating during prolonged exercise subjects with reduced serum sodium vs. those with normal serum sodium have more cramps. There is also importantly no real evidence to demonstrate total body sodium depletion or its depletion in muscle. This must be key issues to demonstrate as it’s the muscle that goes into cramp not the blood. So if the intracellular sodium pool is not different between those cramping and those not Cramping then can sodium depletion be the cause? Salt Stores in Human Body: Salty sweater are they relevant? Typical sodium concentrations in sweat are 20-80mmol/l (460-1840mg per litre) and in workers exercising at relatively low intensity in high temperatures for 10 hours may (not actually occurring but predicted from hourly loss) have sweat losses of 10g sodium (Na) or the equivalent to 25g salt (NaCl) per day. Without external intake this would be a loss of 50% of the total body stores. Given the role of sodium in muscle contraction, nerve function and indeed blood pressure; then the sodium loss can be theoretically important. But weather you’re a light (20mmol) or heavy (80mmol>) sweater we must consider the reality of what happens during an event as almost all athletes take on some sodium in drinks and foods that are on the course. In addition we must consider that the body will try to excrete excess sodium and retain sodium when intake is too low (providing the kidneys function correctly). The potential issue with this is when too much water is consumed and too little sodium – the result is hyponatremia (dangerously low blood sodium levels.) Of course on a daily basis too much sodium can increase blood pressure due to the retention of excess blood volume. As with everything there must be balance for health. The problem with most published endurance studies looking into sodium depletion and cramp is we do not see sodium depletion occurring as measured in the blood (extracellular fluid). This maybe as a result of the release of sodium from other body stores. At this point despite the development of magnetic resonance imaging[7, 8] for real time measurement of Sodium within the muscle (in and out of the blood) and other intracellular organs its not usable in the field (i.e. what happens during an Ironman). What we do know is that there is no proven relationship between sodium loss and cramping in healthy athletes. This latter neuromuscular model I believe is in the vast majority of athletes the primary cause of muscle cramping during exercise. From my own experience, cramping of my calf’s during swimming post-run (not dehydrated post run) would mimic what has been demonstrated in laboratory models used to bring about muscle cramp. So I do a run (I run off my toes) and as such the muscle is in the shortened (contracted) position (i.e. toes pointed down). Then I go for a swim and again my feet are extended (plantarflexion) and point behind me. In both exercises the muscle in in the contracted (shortened) position. In lab tests trying to bring about cramping in a repeatable manner demonstrate performing exercise with the muscle in the shortened position followed by some free exercise then followed by exercise of muscle in shortened position again brings on muscle cramp. Similarly, models where electrical stimulation to shorten the muscle and hold it in that position brings about cramp. [12, 13] These studies in conjunction with the lack of evidence demonstrating that cramping and non-cramping athletes are not related to levels of sodium loss/dehydration indicate a neuromuscular basis for cramping. For me personally – the mechanism of cramping on the function of the body is interesting ‘academically’. However, my real interest and probably for most of you reading this is how do I prevent it? If dietary what do I do? How much of x? When to take? And what’s the benefit (Performance)? So lets look at some the action points from the research and how it’s useful to you as an athlete. Excessive fluid loss does impair performance, and we know this from many studies. But the level of fluid loss is important. A few KG’s may actually be beneficial towards the end of an Ironman race with data on elite athletes nearly always demonstrating the fastest performances are those with the greatest levels of fluid loss (up to 8% of bodyweight i.e. 5kg for a 70kg athlete). Whilst this topic on dehydration is a whole other area the academic debate contained in reference 14 is a good start for a discussion of some of these issues. 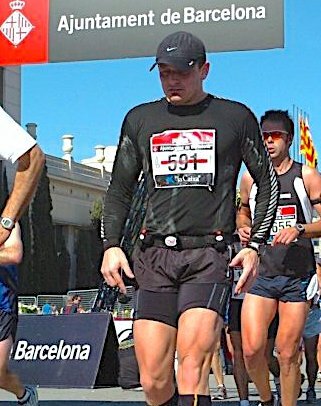 In Ironman we are not just talking about loosing 2-5kg in bodyweight. If we had a sweat rate of 1ltr per hour that’s a potential fluid loss over the event of 15-16ltrs. Of course this is impossible as we would have developed sever dehydration and heat stroke well before that level of loss. But it demonstrates a potential performance risk and that to get through such an event an adequate hydration strategy is required to maintain health and performance. My own view on the benefits of salt (sodium) use during prolonged endurance exercise like Ironman is its effects on hydration rather than any effects that are related to cramp prevention. This has been demonstrated in many studies but my favourite is by Professor Maughan and John Leiper. In this study the take home for subjects exercising until they lost about 1.5kg of body weight through sweating, could hydrate to a much greater degree the more salt that was present in their hydration drinks (See below for more detail on the study). Therefore, what are the practical considerations from such research? If your sweat rate is over 1tr per hour (Mine during a run can be as much as 1.5trs) then it becomes very difficult to take on board that level of fluid to make sure you maintain your core temperature and hydration levels. Although its possible to train the gut like any other organ in the body to tolerate such high fluid intakes, for many its very difficult and forcing in such levels could result in gut issue during a race. As such the supplementary intake of sodium can be a great option to enhance the retention of what you do take on and as such reduce the risk of dehydration of ultra-endurance events such as Ironman. In addition the amount of carbohydrate in your sports drink will also play a role in hydration and the lower the levels of carbs the more hydration but likely less energy taken on board. The high the concentration (amount of carbs) of carbs in your sports drink the less hydration but more energy delivery. As such there is a trade off between hydration and energy delivery but the prevailing view is a concentration of about 5-8% carbohydrates (that’s 25-40g carbs in your 500ml drink) is a nice option. As this article is primarily about salt/sodium we will revisit carbs in another article. There has been a big push for athletes to measure (have tested) the amount of sodium you loose in sweat. There are a number of issues with such tests I want to discuss before you go and burn some cash on this type of testing. Firstly, as you loose water through sweating the body will try to retain sodium. Secondly, dietary changes in salt intake will impact the levels of sodium you loose during exercise (example during winter months your salt intake maybe lower than summer when you use more sports drinks containing salt). Thirdly, the suggestion is sodium loss is the cause of cramping when as above we have demonstrated this is not correct. Finally, most of these tests assess sodium loss (they actually look at chloride release) on one point in the body (example forearm). It is know that sweat rate and sodium loss is dependant on where the measurement is made (arm vs legs), and when the measurement is made (point of fitness during the season, environment) and as such any one off measure for whole body sweat rates during exercise is questionable. What is know is that the most accurate way to assess sweat rates is via weight loss and I will discuss this to a great extent in the ‘HOW TO GUIDE’. Figure 2. Pilocarpine a chemical used in sweat testing. The reasons for such difference are pretty common sense as local (forearm) sweat stimulation from a electrical impulse and Pilocarpine is that during exercise and heat stress there are alterations in blood flow, neuromodulators, adrenergic stimulation etc. Therefore, its of no surprise that the test alone (even by companies using it) is normally not relied as delivering a answer to sweat and sodium loss rates. Instead testing companies implement questionnaires into the discussion, suggesting the test is little more than a gimmick to make the whole process more scientific. Finally, if there is an optimal level of sodium for each person than how can we square that with studies such as that of Professor Maughan and John Leiper? In this study the authors provided 1 of 4 drinks following exercise that resulted in 2% loss of body mass (circa 1.5kg). The drinks where at a volume of 1.5x the loss of bodyweight (circa 2.25ltrs) post-exercise, with the only difference in the composition being the sodium (salt) content. The dose of salt was 2 (46mg), 26 (598mg), 52 (1195mg) or 100mmol (2300mg)/ litre of drink, which was consumed within 30 minutes following exercise. Drink volume 2.25ltrs within 30minutes. The results demonstrated that the higher the sodium concentration the great the fluid retention in the following 5 and half hours post exercise. However, although the difference between the 1.2g and 2.3g was not significantly different from each other based on fluid retention. As such a dose around 1.2g was the optimal intake for rehydration in these subjects. As I said the important part of all this discussion is to demonstrate practical application and where possible evidence for benefits. In 2016 researchers from the University of Spain assessed the impact of salt supplementation on half Ironman performance. A group of 26 experienced (7-8yrs) All the participants were instructed to take 867mg sodium (plus 1.3g chloride, 265mg potassium, 44mg magnesium) during the transition between the swimming and cycling sections, the same again around the middle of the cycling leg, and again during the transition between the cycling and running sections. The subject would either be given the salt formulation or a placebo (cellulose) without knowing. The temperature during the event was 22.5+/- 2.7 °C (18.8–26.6°C) with a relative humidity of 36.8 +/- 8.3% (32–45%), the swim 17°C. So what’s the take home from this everything from this article? 1. Calculate fluid intake based on real fluid loss (whole body sweat rate): Void your bladder pre-exercise then weigh yourself naked before exercise. After an hours exercise at intended race pace and temperature whilst also taking on board your intended drink at 500-1000mls over that hour weigh yourself again. When you have the weight loss take into consideration how much fluid you consumed over the hour. Example: Starting (pre-exercise) weight 72kg – post exercise 71kg. Fluid consumed over the hour 500mls. Total sweat rate = 1kg + 0.5kg = 1500mls/hr. 2. Sweat rate can vary between days in the order of 5-15% so your sweat rate using the example above could be 1500 +/- 75-225mls. Therefore, you should practice consuming during training at least replacing what has been lost during exercise. This may require practice and training so perhaps starting at 800mls per hour and increasing 100-200mls each week (depending on how your gut reacts). 3. Sodium would be suggested at 500-1000mg/ltr of fluid (ideally closer to 1000mg). Note that again individual tolerance to sodium can vary so practice in training. 4. Carbohydrate composition: Suggest using a glucose or maltodextrin plus fructose based drink at a dose of 5-8%. So for 500ml bottle you would place 25-40g into your drink bottle and fill it with water. Again practice using different concentrations of carbohydrate. Note: Maximum levels tolerated of mixed (glucose:fructose) carbs are 60-90g/hour although adding caffeine may also be beneficial. 5. Be careful of using commercial sweat testing be sure to ask: 1. how they know their test works in athletes, doing your sport (evidence), 2. is the test reflective of whole body sweat rates (evidence? ), 3. Relevant in predicting sweat rates in the environment you will be competing in (hot/cold/humid etc)(evidence?). If they cannot provide a study to shows the test and predictions are correct then you should consider why are you spending cash when you can use the free method above that would likely be as or more accurate. Note: A special thanks to some of the thought leaders in the area of sodium and salt supplementation for endurance athletes specifically Prof Tim Noakes. Whilst I don’t agree with all Dr Noakes concepts and ideas he has been willing to push back against much of the scientific dogma regarding salt use in endurance sports. Its key to let your mind be flexible to new ideas and concepts and not read research with pre-conceived ideas and views and let the data (the raw data) speak for its self. For that reason Dr Noakes has been a leading figure. 6. Note: 52.7g Sodium equivalent to 131g of Salt (45g in Extracellular (Blood Plasma (about 55% of total blood levels) and Interstitial fluid (fluid around cells), and 7.7g in the intracellular tissues such as muscle. 10. Schwellnus MP. Cause of exercise associated muscle cramps (EAMC) altered neuromuscular control, dehydration or electrolyte depletion? Br. J. Sports Med. 2009; 43:401Y8. 11. Norris FH, Gasteiger EL, Chatfield PO. An electromyographic study of induced and spontaneous muscle cramps. EEG Clin Neurophysiol 1957;9:139–47. 12. Bertolasi L, De Grandis D, Bongiovanni LG, et al. The influence of muscular lengthening on cramps. Ann Neurol 1993;33:176–80. 15. Maughan RJ, Leiper JB. Sodium intake and post-exercise rehydration in man. Eur J Appl Physiol. 1995; 71: 311-319. 16. Bates, GP, Miller VS. Sweat rate and sodium loss during work in the heat. J Occup Med Toxicol. 2008; 3: 4. 18. Morris NB, Cramer MN, Hodder SG, et al. A comparison between the technical absorbent and ventilated capsule methods for measuring local sweat rate. J Appl Physiol. 2013;114:816–23. 19. Boisvert P, Desruelle AV, Candas V. Comparison of sweat rate measured by a pouch collector and a hygrometric technique during exercise. Can J Appl Physiol. 1997;22:161–70. 20. Taylor NA, Machado-Moreira CA. Regional variations in transepidermal water loss, eccrine sweat gland density, sweat secretion rates and electrolyte composition in resting and exercising humans. Extr Physiol Med. 2013;2:4. 21. Hjortskov N, Jepsen LT, Nielsen B, et al. Pilocarpine iontophoresis test: an index of physiological sweat secretion? Clin Physiol. 1995;15:409–14. 22. Vimieiro-Gomes AC, Magalhaes FC, Amorim FT, et al. Comparison of sweat rate during graded exercise and the local rate induced by pilocarpine. Braz J Med Biol Res. 2005;38:1133–9.